Comment: the 2007-2008 Central Valley salmon collapse was attributed to several potential causes: poor ocean conditions for spawn/brood years 2004 and 2005, poor 2004-2005 Bay–Delta conditions, and lack of hatchery pen acclimation in the Bay.1 Most likely that collapse was related to drier river conditions from years 2001-2005 and critically dry years in 2007-2008, after wet conditions in years 1995-2000 resulted in high population levels. The new 2016 low is likely a consequence of the drought years 2012-2015, and specifically of poor conditions in the Yuba River. Comment: Since the Yuba River is the largest tributary of the lower Feather River, one would expect it to receive a portion of the wild and hatchery salmon production of the lower Feather. To define this as “straying,” given that the genetic stocks are identical, is debatable. What is unusual is that the Yuba run is made up of predominantly Feather River hatchery fish, thus indicating poor natural production from the Yuba itself, particularly in drier years. There is something about the Yuba that leads to poor natural salmon production at least during or after drought periods. 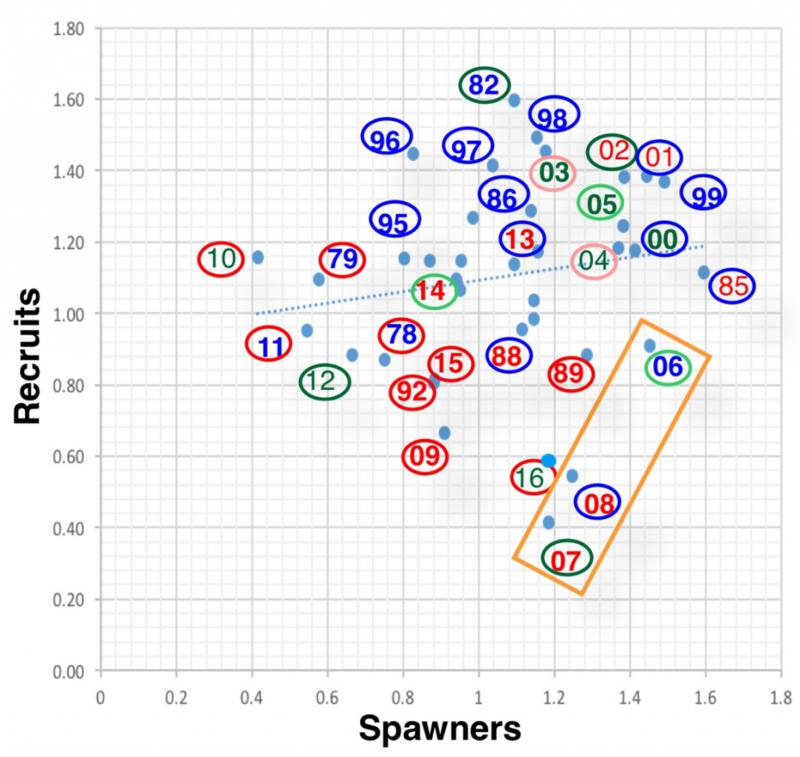 There is a basic underlying positive S-R relationship – lower spawner levels produce less recruits and visa-versa. There is a strong effect of water year conditions – wet years enhance production and dry years have generally poor production. Poor runs are also related to poor winter-spring rearing and emigrating conditions two years earlier in the Yuba and/or Bay-Delta (1989, 1992, 2009, 2015-2016). Stronger runs occurred when early rearing and emigrating conditions were good (e.g., 1986, 1995-2000). Poor runs in some years may be related to poor Feather hatchery smolt survival or poor early conditions for ocean rearing. Poor early ocean rearing conditions and lack of hatchery smolt pen acclimation in the Bay may have contributed to poor runs (e.g., 2006-2008). Higher winter-spring flows help carry young to and through the Delta, provide habitat and protection from predators, and initiate and speed migration. Higher August through October flows (Figure 3): (a) attract adult salmon, (b) improve passage habitat, and (c) keep water temperatures down (Figure 4). Figure 1. 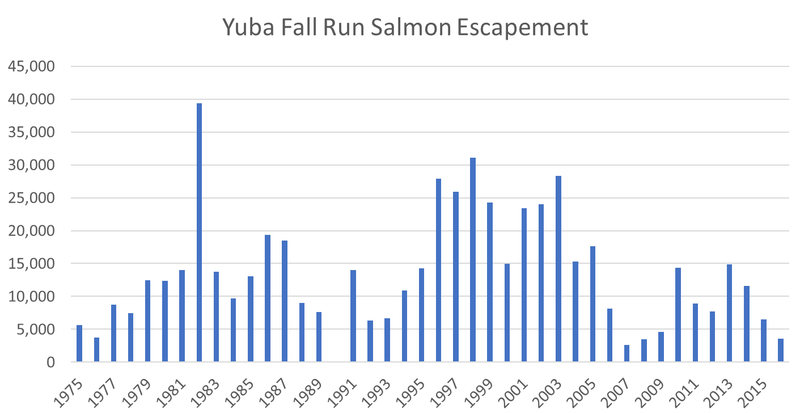 Fall-run Chinook salmon escapement estimates for Yuba River 1975-2016. Source: CDFW GrandTab. Figure 2. Spawner – Recruit relationship for Yuba River fall run salmon. Year is recruit year escapement; for example, “16” is escapement in fall 2016 from 2013 spawn. Bold red years are critical water years. Non-bold red years are dry water years. Bold green years are above normal water years. Non-bold green years are below normal water years. Blue years are wet years. Circles represent winter-spring water year two-years earlier; for example, 08 blue circle represents winter-spring water year classification of “wet” in 2006 when the 08 spawners were rearing and emigrating from Yuba River. Yellow rectangle denotes years in which ocean conditions may have reduced escapement from poor ocean-rearing survival in prior years. Figure 3. 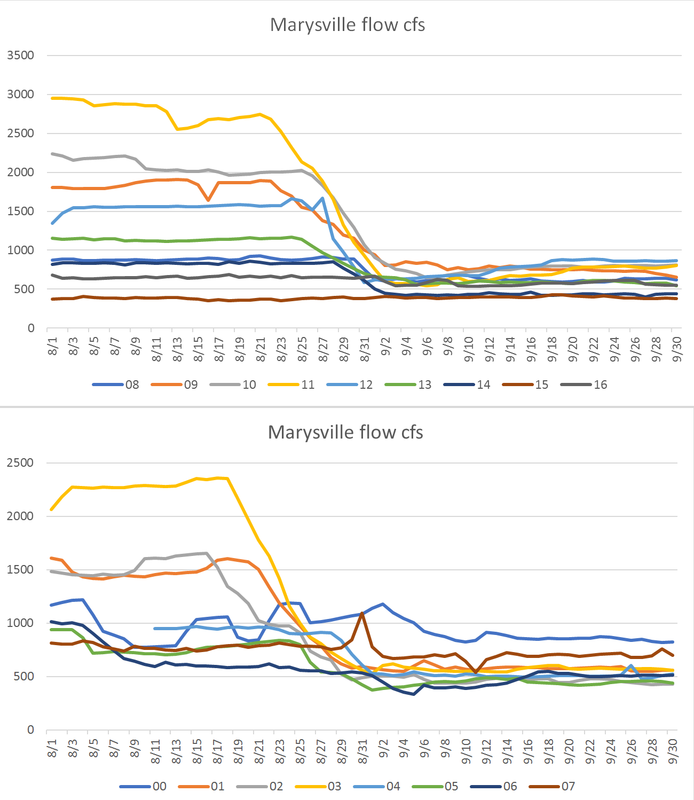 Lower Yuba River flow at Marysville in August-September period in years 2000-2016. Source: CDEC. Of note: lowest flows were in 2014-2016, and surprisingly in 2006. Figure 4. 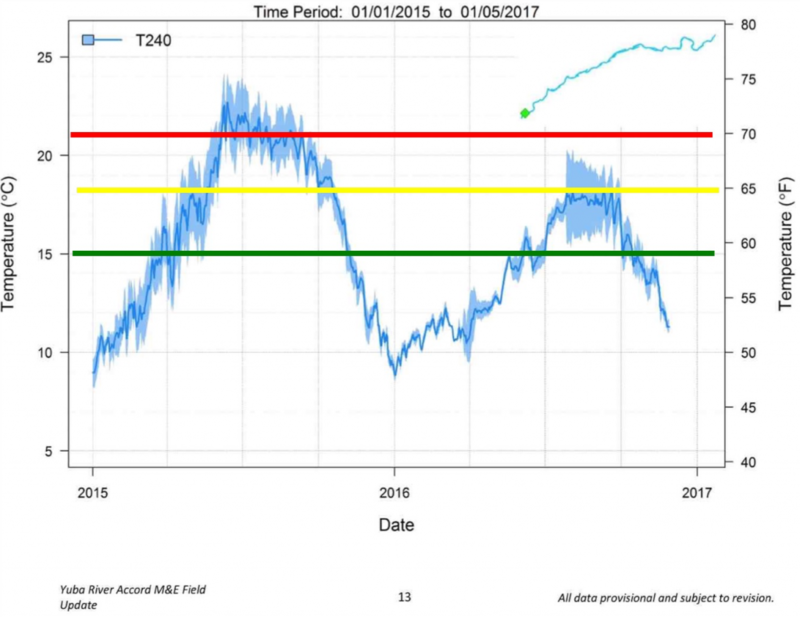 Water temperature in the lower Yuba River at Marysville in 2015 and 2016. Red line is water temperature detrimental to adult salmon survival, passage, and egg viability. Yellow line denotes high stress level above 65°F. Green line is safe level below which adult survival and egg viability are good. Note: August 2015 water temperatures reached above 70°F; September-October 2015 water temperatures reached 65-70°F range. Source: Yuba River Accord M&E Field Update. Comment: First, it is surprising that CAMT would apply “new” approaches and “insights” given that so much has been studied and learned about Delta smelt salvage at the south Delta pumping plants. The salvage problem had been addressed by limiting exports in winter and spring with OMR limits3 and active management by the Smelt Working Group (SWG), an effort that is both highly sophisticated and effective. The working group’s measures have markedly reduced salvage losses but have failed to curb the population decline. The measures came far too late, and managers often did not take the SWG’s advice. More study of salvage is not going to help in learning more about the population decline. Less than ten Delta smelt were salvaged so far this winter (compared to thousands per day historically). The study of the population decline should be focusing now on freshwater inflow, Delta outflow, and spring-to-fall habitat conditions (i.e., Low Salinity Zone and water temperatures), and on the indirect effects of Delta exports. It would be far more effective to showcase the SWG’s actions and other actions required by the biological opinion and by water quality standards, It would also be more consequential for the CAMT to evaluate the consequences of weakening these standards in drought years. 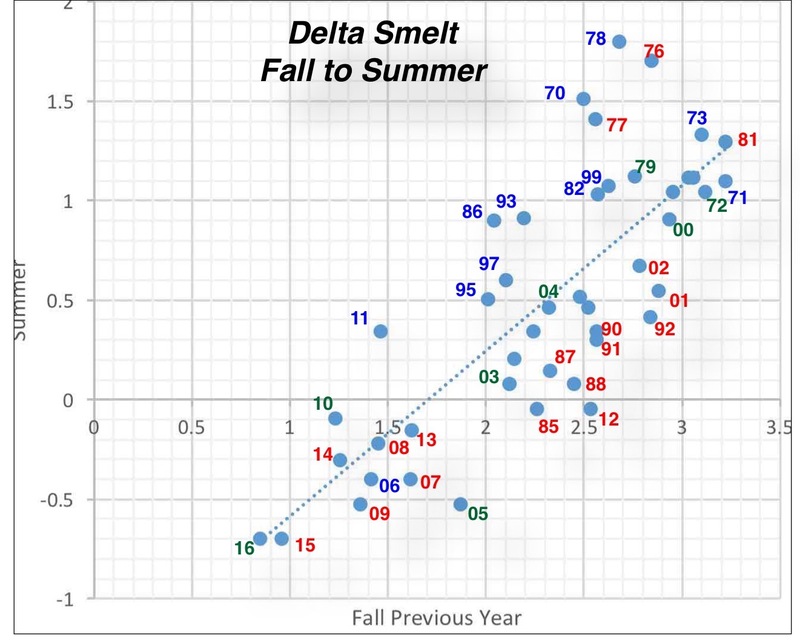 Comment: The CAMT analysis and conference focused on adult Delta smelt winter salvage and the modeling effort employed to understand it. Why? Because the CAMT water contractor members do not like cutting back on exports during the infrequent winter storms in dry years, when the smelt make their spawning runs. Much of a dry year’s water supply comes in infrequent winter storms. Under the conceptual model, higher exports at such times simply draw the smelt spawners into the south Delta4 to be salvaged (killed at fish screens or lost in forebay). When the spawn is in the south Delta, it also makes the annual production of larvae more vulnerable to unmonitored/unmeasured entrainment into the export pumps later in spring. The US Fish and Wildlife’s Delta Smelt Biological Opinion addresses these risks by limiting winter-spring exports. There is no doubt that until these risks are further reduced, there will be no recovery of the Delta smelt population (or other listed Delta fish). Furthermore, until protective actions are extended to Delta outflow, salinity, and water temperatures, there will be no recovery, and the conflict with water supply will remain unresolved and a perpetual problem. Comment: There is nothing wrong with the Fall Midwater Trawl Survey. It captures few smelt because there are few left. All the surveys support this conclusion (see chart below). We are doing just fine in data gathering with the Smelt Larval Survey, the 20-mm Survey, the Summer Townet Survey, the Fall Midwater Survey, and the Fish Salvage Survey. The relationship (log-log) between the fall midwater trawl index and the subsequent summer townet survey index (year noted) is remarkably significant, especially when water-year type is taken into account. Red years are dry/critical. Green years are below/above normal. Blue years are wet. Comment: The context that matters is that the indices and salvage are near zero and have been for several years. Yes, the highly effective Kodiak trawl would be more effective at near zero population. Do we really want to manage the population down at zero, or do we want to smelt to recover? 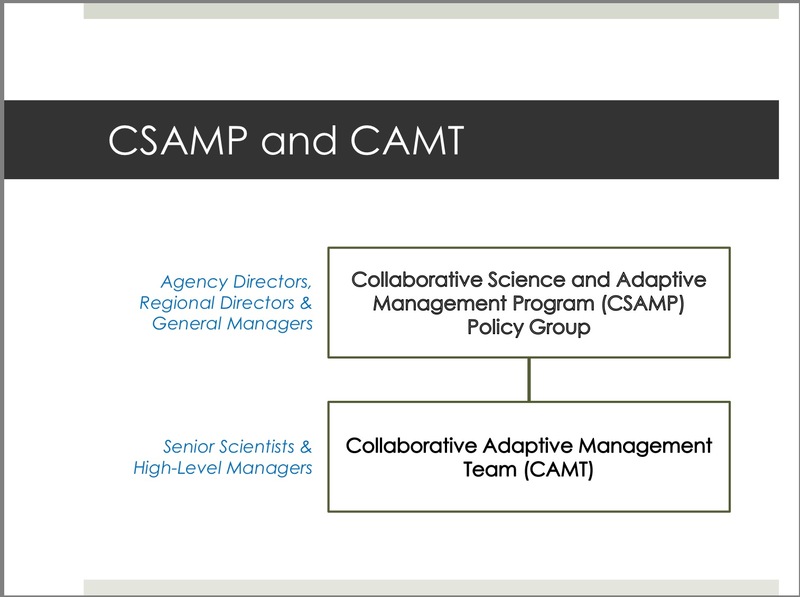 Final point: It is sad that we have to resort to court-directed science in the form of CSAMP/CAMT to resolve the perpetual conflict between water management and the Delta ecosystem. All the effort will be focused on how the ten smelt salvaged this year could have been reduced to five. Can rice fields help save endangered salmon? A recent article in the LA Times asked: can rice fields help endangered salmon in the Central Valley? Because that article really did not answer the question, I thought I would try in this post. The answer is: absolutely. A significant portion of the endangered winter-run and spring-run salmon populations are now made up of hatchery fish. Hatchery fish are important in keeping the populations from falling further toward extinction and in helping toward recovery. To make the hatchery tool in the tool-box of recovery more effective, it is essential that a greater percentage of hatchery eggs become smolts that reach the ocean. Studies show that hatchery smolts released at or near hatcheries have a very poor survival rate to the Golden Gate. Trucking the hatchery smolts to the Bay increases survival, but results in significant straying to other Valley rivers. One way to increase smolt production and survival is to rear a portion of the newly hatched fry in Valley floodplain rice fields closer to the Bay. There have been plenty of experiments that show fall-run hatchery fry do well in terms of growth and survival in rice fields. The next step is putting that knowledge into management action. At a minimum, rearing a portion of newly hatched fry from hatcheries in natural floodplains is more “natural” than rearing them in hatchery raceways. Winter-Run Salmon: Winter-run fry from the Livingston Stone federal hatchery could rear in the rice fields of the upper Yolo Bypass during late fall and early winter. Conditions would be ideal for growth and survival. Even in drought years, water would be available from the Colusa Basin Drain, whose water source is primarily the upper Sacramento River. As proven last year, managers could explicitly divert water for this purpose from near Red Bluff on the Sacramento River, through the Colusa Basin to the upper Yolo Bypass rice fields, and finally to the Tule Canal. This would facilitate emigration of the smolts produced to the Bay. The planned Fremont Weir “fix” will provide Sacramento River water directly to the Yolo Bypass within several years. The alteration of Fremont Weir will also provide passage back to the Sacramento River for any adult winter-run that are attracted to Yolo Bypass flows. Spring-Run Salmon: Spring-run fry from the Feather River state hatchery could rear in rice fields in the lower Sutter Bypass adjacent to the lower Feather River. Rearing would occur in winter, when conditions would be ideal. A late winter flow pulse could facilitate the emigration of these fish (as well as wild fish) out of the Feather River to and through the Delta, and to the Bay and ocean. What about predators? Rice-field-reared winter-run smolts will have 100 miles less migration through the upper Sacramento River gauntlet of predators. Feather River rice-field smolts will be able to pass almost directly into the lower Sacramento River, thereby avoiding many miles of predator habitat in the lower Feather River. Yolo Bypass winter-run smolts would pass through 40 miles of the Tule Canal to reach Cache Slough in the Delta. Added flow and colder mid-winter water temperatures should minimize this real risk. Remember also that rice field habitat is seasonal. Bass and other species that dine on juvenile salmon don’t establish themselves in rice fields like they do in waters that are inundated year-round. How will the progress of these fish be measured? Like all other hatchery fish, these fish should all be coded-wire tagged, and a small portion should be radio-tagged, prior to release. What about straying? Rearing in the appropriate source water should help to minimize straying. Providing flow pulses during emigration will help in imprinting. Imprinting newly hatched fry at the hatcheries will also help. What about contribution to the population, especially given potentially low Delta survival in dry years? If necessary, the rice-field-produced smolts could be readily transported by barge from nearby Verona on the Sacramento River. They could also be released directly to the nearby Sacramento River or trucked to the Bay. In any event, the rice-field-reared smolts should reach the ocean about a month earlier and at a larger size than their hatchery-reared counterparts, which should lead to a marked survival advantage. What if such a program is too successful? This would be a great problem to have, for once. Too many hatchery fish could jeopardize the genetic viability of the population. If that becomes a problem, such a program (or the overall hatchery program) could be scaled back. 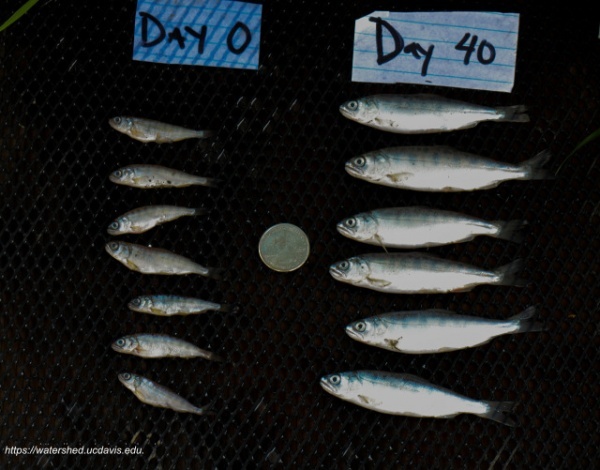 But until we reach that day, floodplain rearing of hatchery fry is a more natural and more effective tool for the recovery toolbox than more conventional hatchery practices. What about landowners? Many rice field land owners and managers are fully supportive and are committed to implementing such a program. What about stakeholders and resource agencies? Such a program has yet to be implemented on a large scale to test if it can meet its objectives. There is a natural reluctance on the part of agencies to commit endangered salmon resources to something unproven like this. Pilot studies to date have proven the concept is viable. An appropriate next step is a large-scale contribution study involving several hundred thousand or more fry, in sufficient number to assess potential contribution to the population. The Bay-Delta Science Conference held this past November focused on the topic of “Science for Solutions: Linking Data and Decisions”. There were a diversity of subjects and presentations on the topic. A special series of papers previewed the conference presentations in the San Francisco Estuary and Watershed Science (UC Davis). The conference presentations and journal articles were a lot to take in. My take on the conference and associated journal articles is that they represent a continuation of a decades-long attempt to avoid and direct focus away from the root cause of the Bay-Delta ecosystem’s greatest problems: high Delta exports, low river flows to the Delta, and low Delta outflows to the Bay under past and present water management. Simply put, there was a lot of the “same-old, same-old” mix of perspectives (excuses), with some new and interesting science. A previous post covered the conference paper on Delta smelt. Another covered introductory presentations. In this post I focus on one presentation and paper entitled Perspectives on Bay-Delta Science and Policy, a summary of the conference prepared by its sponsor’s (the Delta Stewardship Council) Independent Science Board. Nutrients – Changes in and lack of nutrients are now considered important. Contaminants – Delta waters are now considered contaminated. Food Webs – Much less able to support fish than in the past. Multiple Stressors – Multiple stressors work together to cause the decline in Delta native fishes. Storms and Droughts Extremes – Extremes in drought and floods wreck havoc on water management. Landscape Ecology – Restoration has not been pursued on a landscape scale. Dire Straits of Endangered Species – Regime shifts and climate change have contributed to accelerated spiraling declines in native fishes. Even if the underlying science on the subjects (factors) is valid, the arguments that relate these factors to the Bay-Delta ecosystem decline are not. At most, these factors are secondary actors in the overall process driven primarily by water management, Central Valley and Bay-Delta water quality standards, and endangered fish “protections in biological opinions. “In the past we considered nutrients to be relatively unimportant in Delta productivity.” Untrue. The loss of nutrients that went along with water quality improvement over the past half century were always a concern. Sewage treatment upgrades were considered a factor in declines in Delta fish production. Aerial fertilization of the Delta was considered at least two decades ago. “The low salinity zone, once a food-rich region of the Delta, now provides little food for native fish.” This statement is untrue. The LSZ remains the key rearing area of the Central Valley for smelt, salmon, sturgeon, and splittail, because it has the highest concentrations of “food” in the Bay-Delta Estuary. “Aquatic food webs no longer sustain native fishes.” Untrue. Native fish are sustained if given a chance. Smelt and salmon were nearly recovered in 2000 after six wet years and massive recovery efforts and new protections. The protections simply failed to carry over into dry sequences 01-05, 07-10, and 12-16. Poor food, growth, and survival are caused by man-made drought conditions, and lack of protections of the pelagic food web of the Bay-Delta in drier years. “There are few instances in which a single stressor can be identified as the primary cause of any species’ declines.” Untrue. River flow and exports are often the single most important factors in single events, such as winter-run salmon year-class failures below Shasta. “Effective conservation requires a holistic approach.” Yes, one that does not take most of the fresh water from the rivers, Delta, and Bay. “The aquatic ecosystem has gone through a regime shift that cannot be reversed.” Untrue. Taking most of the water out of the estuary from late winter through fall every year keeps the aquatic ecosystem in a semi-permanent drought, broken only by wet water years when large amounts of unregulated water escape capture by water managers. The patterns of the 2010-2011 water years show that negative patterns can be reversed. “The problems have been caused by invasive clam and aquatic plants, and other non-native animals of the Bay-Delta foodweb.” Untrue. These are for the most part secondary responses to the real cause: greater exports and low river flows. “More frequent and extreme storms and droughts will occur.” Four of last five, seven of last ten, and ten of last sixteen years have been part of drought sequences. From 1987 through 1996, seven of ten years were drought years. Water year 2017, though extreme, is not unlike previous very wet years. “Habitat restoration has cascading effects.” In truth, restoration has as yet been minimal, with minimal evidence that it contributes substantial beneficial effects. “The ecological regime shift and climate change are accelerating decline of native species.” While climate change certainly is not helping, the declines of native species are for the most part avoidable by reducing demands on water. The most important “regime shifts” of the last several decades have been shifts in water management strategies. Incorporate long-range (50 year) thinking into Delta science and management. Acknowledge the accelerating rates of change ahead, and the inability to return to past conditions, in evaluating and planning feasible options for the future. Long-term planning is generally a good idea, but this formulation ignores current reality and the need to (1) return to past levels of protection, and (2) be wary of water management strategies that would further undermine the Bay-Delta ecosystem. Incorporate more exploratory and forward-looking science into government science programs at all levels, including science not tied to any current policy or crisis. Start planning now for about 15% of the overall Delta science budget to transition into more forward-thinking science. More science is not the answer. More science is more smoke. Widen science career paths in state agencies so that scientists are not forced to abandon science to advance their careers. More scientists are needed in management to apply the science that is already available. Plan for variability and extremes in the decades ahead, as well as long-term change. Bolster the ecosystem’s capacity to absorb both drought and deluge by continuing to reduce the state’s demand for water supply from the Delta, as required by the Delta Reform Act of 2009. Replenish Central Valley groundwater reservoirs and promote agricultural practices more resilient to drought. Adjust water management practices to accommodate less predictable sources of supply and more variable flows. Sound advice. Adapt management practices to take advantage of any ecological, recreational, and economic values to be gained. Yes, take advantage of low cost, high benefit practices. Begin the scientific and societal groundwork needed to seriously explore alternatives to conservation in place for endangered species. Continue all reasonable efforts to provide for them, including reducing water demand on the Delta, but recognize that the time has come to develop the science and policy foundations for more radical approaches, including assisted relocation, assisted evolution, and cryopreservation. There is also a need to enhance and build conservation hatcheries. But most of all, we need to protect and enhance the resources we have left. Invest now to develop models of the Delta system, analogous to global climate models, that more fully integrate physical, ecological, and social sciences. 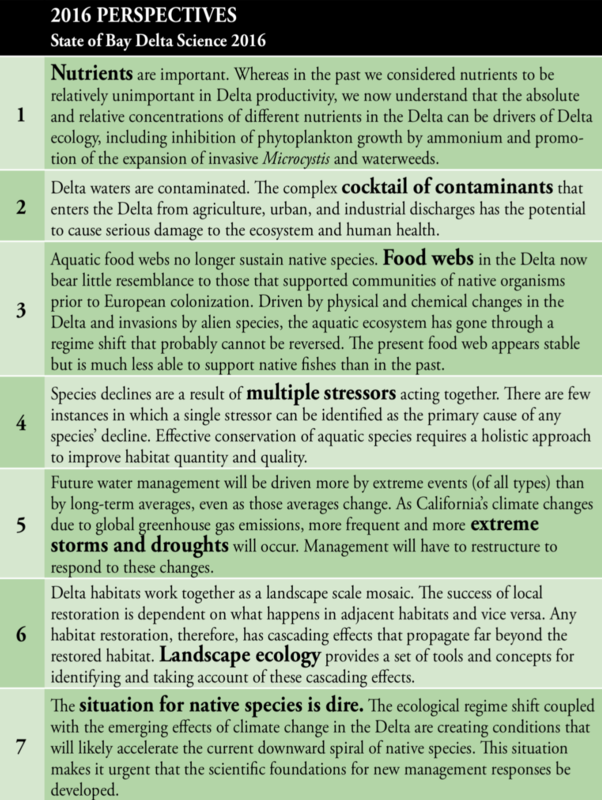 Use these models to forecast likely outcomes from changing climate and other external forces acting on the Delta, as well as likely effects of various management policies. Math models of complex ecosystem function are unnecessary – simpler conceptual and statistical (data) models are more realistic and better management tools. Weave “Delta as an Evolving Place” into all science, planning and management programs. Stop allowing further “evolving” and start de-volving where reasonable. The Bay-Delta is not really evolving; it is just ever-increasingly being disturbed. Rethinking the above perspectives and actions would be a reasonable first step toward a more progressive strategy for the Delta Science Board. At its November 2016 Bay-Delta Science Conference, the Delta Science Program addressed salmon survival in the Delta..
PART 1: EFFECTS OF WATER PROJECT OPERATIONS ON JUVENILE SALMON SURVIVAL IN THE DELTA: LITERATURE AND DATA REVIEW. Presenter: Dr. Rebecca Buchanan, Research Scientist with the University of Washington. The presentation was summarized in Mavens Notebook. Some of the findings are provided with comment below. Comment: the contribution of low flows and associated predation and high water temperatures are known, as are effects of hindering migrations of salmon both upstream and downstream. The finding does not take into account salvage inefficiency, especially from Clifton Court Forebay pre-salvage loss, and loss in the south Delta from diverting these fish from their migration routes. Comment: There is no such evidence. The association is simply between high natural production and/or high hatchery releases on the one hand, and high salvage rates on the other. Comment: the E:I ratio does not reflect the role of the individual factors in the presence of the other. For example, the low-export/low-inflow scenario is a far different than a high-export/higher-inflow scenario with the same E:I ratio. “Our primary finding was that salmon survival in the South Delta is low, which is not a big surprise; we knew it was low, but what was somewhat surprising is just how low it is and how consistently low it has been, especially for the San Joaquin fall run chinook”. Comment: The low survival through the Delta has long been known from tag studies and low run size resulting from dry years, especially in the San Joaquin watershed. Low flows have long been associated with poor habitat conditions and high salvage losses in the Delta. Comment: There is a tremendous amount of data on the role of the Delta in the overall production of salmon in the Central Valley. Much of the analyzed effects points to droughts, low reservoir releases, low river flows, low Delta inflows and outflows, and direct and indirect effects of Delta exports. There is sufficient information to support and warrant OMR (exports restrictions) from fall through spring in NMFS’s biological opinion. There is also sufficient information to show that the restrictions do work, an analysis that was not conducted in the study. “The tag studies that we have available to us represent only part of the life histories in populations that use the Delta, smelt-sized hatchery fish, so we’re missing the smaller fish and we’re missing the wild fish”. Comment: This is true. Tagging/release of springtime fall run smolts represents a limited fall run life history group forced to navigate the Delta later than they would in the wild. At minimum, a majority of emigrants would naturally leave earlier. Comment: Indirect effects include water temperature effects, flow effects, habitat effects (e.g., location of X2), predators, etc. There has been much research on these effects, including substantial research on salmon. Comment: Formal analyses have been conducted over the past half century. All these analyses have led to the same conclusion: salmon survival is low when through-Delta flows are low, when exports are high, and when salmon salvage is high. Comment: Again, the available information and analyses are extensive. The range of observed conditions is wide. The range of survival and recruitment into the populations is also wide. These statements are little more than excuses offered to sustain additional decades of the present review process that is reluctant to state conclusions and even more reluctant to take appropriate management action. There has been minimal analysis that highlights the beneficial effects of actions required in the 2009/11 Biological Opinion. The requirements of the Biological Opinion led to significant reductions in winter exports. These reductions have had a marked positive effect on the survival of salmon through the Delta.